As water becomes a limited and costly resource, water conservation practices in turf grass management will become a necessity. Deficit irrigation (DI) is a common agricultural practice that enables reduction of water expense with minor yield loss. 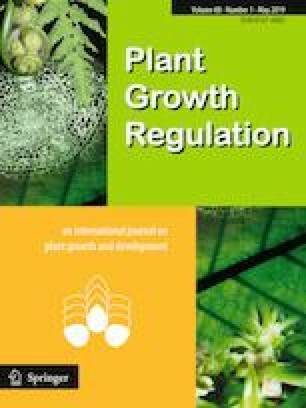 Plant growth regulators (PGRs) restrict plant growth and consequently affect evapotranspiration (ET) rate, soil water depletion and plant tolerance to drought. Our studies evaluated the physiological effects of the PGRs paclobutrazol (Pac) and uniconazole (Uni) in the warm weather turf grass Zoysia japonica under DI in field conditions. Our studies demonstrated that Pac and Uni reduced plant ET rate in greenhouse and field experiments. Uni, was more potent at a low concentration (25 mg L−1) than Pac, with greater effect on reducing ET rates, plant vertical growth and biomass accumulation while enhancing tissue chlorophyll content. Under field conditions, both Pac and Uni lowered ET and clipping biomass and raised chlorophyll levels at DI. Additionally, results suggested that Uni increased leaf concentration of abscisic acid (ABA). We conclude that PGR application to the Zoysia turf grass simultaneously improved the clipping management and lowered turf grass water requirement, while maintaining high leaf appearance under deficit irrigation conditions. The online version of this article ( https://doi.org/10.1007/s10725-019-00484-4) contains supplementary material, which is available to authorized users.